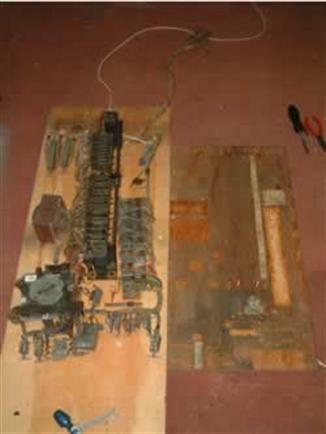 The motor board from an early sixties Bally game. Everything on here has been gone through. The board was filthy, so all components & labels were removed, the board was sanded & sealed, and everything refitted. 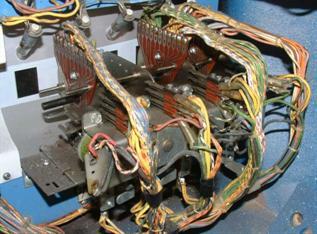 It's important the inside of a game is clean, otherwise the ball picks up the dust and slowly wears out the playfield. I always vacuum out and blow the game clean with an air line after all the work is completed. That makes sure all the filing dust, solder specks and general debris is removed. The rear of a Williams light box (left) and a Gottlieb under playfield. All this has been completely gone through. I can repair your non working or faulty game. From fixing a small fault to make it work properly again, to a complete electro mechanical overhaul to make it play as new. New, good used or NOS parts will be fitted as required and agreed. Good used parts can often be located where new or reproduction parts are not available. If you have a faulty or non working flipper or bingo game, and would like to have it working properly again,contact me to discuss it. Inside the head, almost all the components of all but the early bingo games are in the head or on the back door, there are far fewer components in the cabinet. Everything you see in these images has been stripped, cleaned, lubed & rebuilt. Also note the new corner bracing to the back box. I had to repair all four corners as it was not structurally sound when I bought it. The back door. This has just been replaced. All these units were slid on to a temporary stand, a new door made using the original as a template. It was painted to match the original colour, and all the components were fitted to it. New labels were made & stapled on. The magic squares gearing. These spin constantly when the game is on. Note the heavy engineering, no wonder these games could run twelve hours plus every day, operate a million plus cycles and still have very little wear. These are the most complex EM pinballs ever made. These are the wiper discs those gears drive. They are released by index relays, and are driven via leather clutch washers, lubricated by Neatsfoot oil. They operate the magic squares & lines, via buttons on the lock down bar, and alter the circuits accordingly. 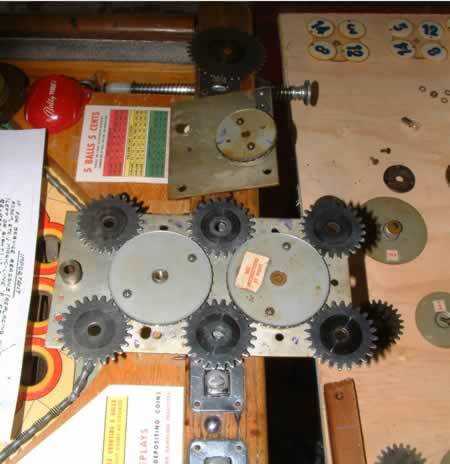 The gears all cleaned up, ready for fresh grease and reassembly in to the magic squares unit. Most of the games I buy have not been used for many years. They will just about light up when I first turn them on. Some may play a game, sort of, but most are in need of serious work. When I have determined that the game powers up, I turn the game off and go through it electro mechanically from top to bottom. That means stripping, cleaning & rebuilding every component, cleaning & gapping every contact, fitting new parts as required. Then I reassemble the game and test play it again. I attend to any small faults remaining and refine how it plays. Then I repair or replace all the faulty lampholders and lamps. Blackened lamps should always be replaced. Even if they still work, they get much hotter than a good lamp, and the heat can damage inserts and warp plastics. When the game is playing as it should, and lighting up as it should, I have finished the repairs. As long as it is then played regularly, it should play properly and work for years. The odd small fault may arise as these games are now several decades old, but as the game will be working as it should when a fault occurs, it should be easy to diagnose and repair. An occasional replacement rubber ring set and regular playfield polishing is all any game should need. The next job is to restore the game cosmetically. 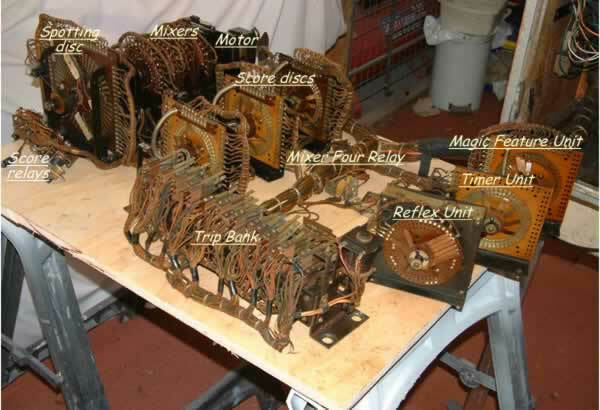 The games I have a preference for are termed electro mechanical machines. Those built up until the late seventies. 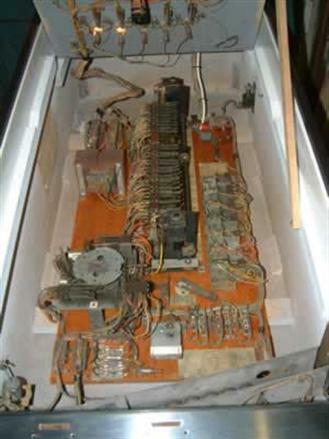 There are two types of pinball, modern games using solid state circuit boards, and EM games, the ones manufactured up until around 1978. They function using solenoids, switches formed from blades and contacts, and one or more motors. Electricity energises the coils and motors which operate cams, levers and other mechanical mechanisms to control the functions of the game. The wiring in these games is mostly cloth insulated and wax laced, the method used to wire aeroplanes. This is because it is resistant to vibration. The EM games are basically bullet proof. When an example is fully restored, and as long as it is played frequently to allow all the switch contacts to self clean, it will most likely be reliable for decades to come. 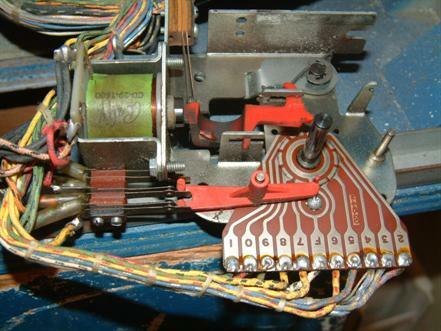 The games built after 1978 use modern chip based circuit boards to control the game. It allows for more complex design, but the fragile circuit components are easily damaged by static electricity, voltage spikes, shorts, battery leaks and errors made whilst attempting repairs. Diagnosing and repairing faults is also far more complex. They are also mostly wired using plastic insulated cable held in looms using cable ties. The cabinets also altered in design and the materials used. EM game cabinets were built mostly solid timber with some use of plywood. The later EMs used more plywood. The SS games used less robust materials, including MDF. Generally, the newer the game, the poorer the build quality. EM playfields, especially those from the 60s and earlier, wear extremely well. Some of the SS games show serious wear of the playfield art in a very short period of use. The choice between EM and SS games is a personal one. SS games are very popular and can command very high prices. I specialise in EM machines because I have a passion for them. I get a great sense of satisfaction when I've bought a game back to life, have it looking and playing as it did when new, and can enjoy the challenge of trying to beat it. Many of these old games had metal game start buttons on the coin doors. The only thing insulating those buttons from the mains voltage switch is a piece of (now) several decades old fish paper. It needs replacing and an extra layer of insulation added for safety. Many of these old games had contacts inside the game which are at mains voltage. 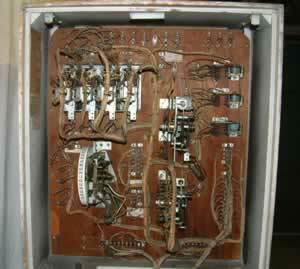 Mostly, for these circuits they used plastic insulated wires instead of cloth insulated, but not always. Never work on a game whilst it is plugged in. Many of these old games had metal flipper buttons, some insulated from the switch using fish paper. 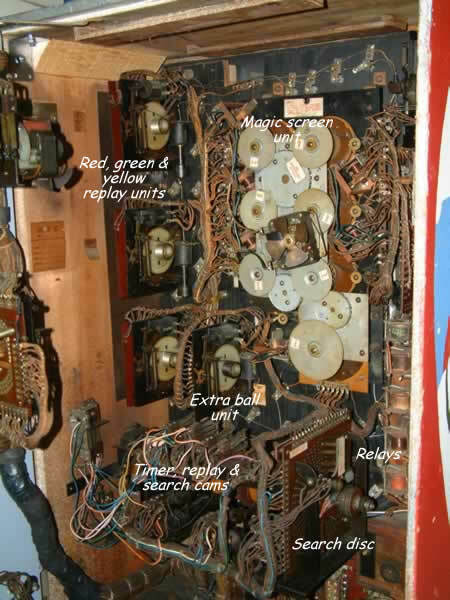 Gottlieb games with flipper switches under the playfield operated by thick wire levers have no insulation. Heat shrink or similar needs fitting over the wire where it touches the flipper contacts. Some games had a flipper button that lit the game up when pressed. The switch it operated was often mains voltage. It needs better insulation than the old fish paper that the factory installed. Many of these old games have mains voltage going through the Jones plugs, the Bakelite strip plugs and sockets that connect the motor board, playfield and light board in the back box together. Never mess with them whilst a game is plugged in. Many of these old games had no on/off switch or a switch which was located on the motor board, operated by a kick on the base of the game. It is therefore possible for a game to appear turned off, but still have mains voltage at certain points throughout the game. I always add an under cabinet on / off switch, under the right front of the cabinet. When it is off, there is only mains voltage to one side of the switch, which has an insulating cover fitted. Don't leave keys in the coin door and keep it locked. Never work on a game in bare feet or wearing only socks, wear shoes with insulating soles. Certain 1960s Gottlieb games required a hand to be put inside the game, through the coin door, to reach and pull the playfield unlatching bar. 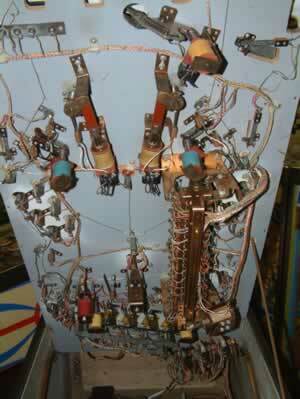 This unlatches the playfield so it can be lifted up. Always unplug a game before doing this. I attended a game where the pop bumper was permanently energised. 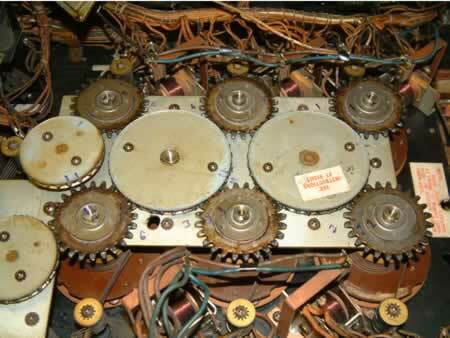 As soon as a game was started, the rod & ring pulled down and the coil buzzed loudly. A quick check of the spoon and EOS switches showed they were fine. A look at the relay revealed all. A wire solder joint had broken, and it was now touching another lug, causing the short, which was feeding the pop bumper coil. The near complete lack of solder on the lug shows that this joint was not soldered properly to start with. The wire had never been put through the hole, so the joint was not as strong as it could have been. The lug was cleaned up and the old solder was cleaned off the wire, which was put through the hole. It was then soldered and should now be fine. This is one of the reasons I play test all my games for a couple of months before they are offered for sale, to weed out any potential weak spot. All my games are fitted with a new three core mains lead and under cabinet on/off switch (if needed). They are all earthed from the earth pin on the plug to the transformer chassis, under cabinet switch housing, coin door and lock down bar. 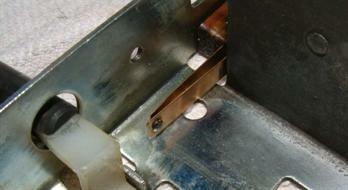 If the coin door has a mains voltage replay switch, extra insulation is fitted to it for added protection. For those who do not wish to fit an under cabinet switch because it means drilling the base board, thus making that non original, I have started to use an excellent alternative. Maplins sell a remote controlled mains socket adaptor with remote control unit. Kits can include 1 ,3 or 5 adaptors and a 4 channel remote control. A single adaptor can feed extension lead which could feed several games, and the adaptor can switch the power on and off using the remote control. 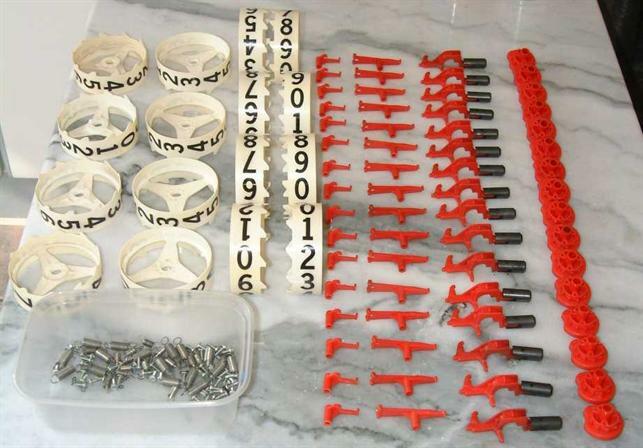 The cost of a single kit is just over a tenner, excellent value. The total load that can be switched is well over anything a few pinball games consume, making this a very useful method of turning games on and off. Just go to the Maplins web site, search for 'remote controlled socket' and the various options are there. I am using these myself, and can highly recommend them. A Gottlieb replay switch stack where the fish paper insulation is no longer in the correct position. 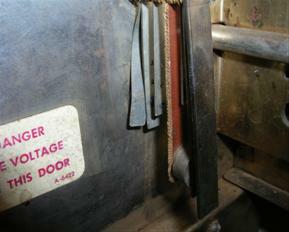 The two switch blades nearest the door (replay start switch) and the two between the bakelite spacer and the metal stop bar (slam tilt switch) are carrying 240 volts on a UK game. The displaced fish paper can be clearly seen, moved because the switch stack is loose. The metal replay button is insulated from the switch blade by the fish paper. It is pushed to start a game that has replays to use up. This coin door had no earth! It was only luck that stopped the metal start button from hitting the switch blade, which would have made the metal door and start button potential death traps. The centre image shows where the button originally pushed on the fish paper, and how close it came to hitting the actual blade. The right hand image shows how it would have originally sat. Switch stacks come loose when the Bakelite layers that make up the stacks shrink because the game has been stored in unsuitable conditions. I replaced the fish paper and added a second layer of insulation to this game to ensure it would be safe for years to come. I also earthed various metal components throughout the game, including the coin door. In the very unlikely event that the door should ever be exposed to mains voltage again, the earth circuit would either trip any RCCD or MCB on the house consumer unit, or at least blow a fuse in the mains supply to the game. Notice the warning label on the door. The line voltage is really on the switch stacks. Perhaps Gottlieb expected it to end up on the door at some time in the future! The games built up to the end of the 1960s were made when the attitude to electrical safety was rather lax compared to that which is in place now. As an example, household lighting circuits in the UK were often not earthed. However, completely omitting an earth circuit on games where exposed metal components were in close proximity to UK mains voltage is surprising to say the least. Gottlieb did exactly this. The games only had 2 core mains cables so no earth circuit was possible. I have seen Williams and Bally games with earth circuits from this era, and they had plastic start buttons that could not transmit high voltage, making the earth circuits less important. It is vital that any game is checked to see if any earth circuits are present, and if there are, that there is a 3 core mains lead to feed those earth circuits. If no earth circuit exists, it is essential that the game is modified to include this safety circuit. This means an earth from the pin on the mains plug to the transformer chassis, then to the under cabinet mains switch (fit one if no switch is present), then to the coin door and then to the lock down bar. Extra earths to the side rails and other exposed metal parts may also be required. 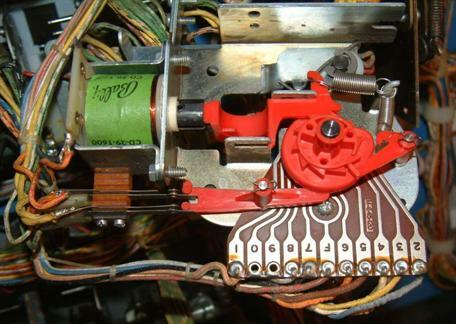 Overhauling the score units on a Bally Fireball - all sixteen of them! The partially stripped score units sat in the brackets. 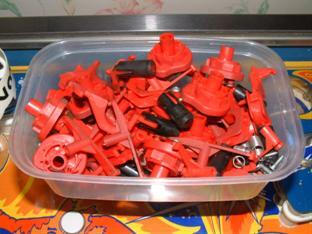 The removed cams, levers, coil plungers, metal springs, clips and screws. The score drums. All are stripped from the units, ready for cleaning. They will firstly be cleaned in an ultrasonic cleaner, then with a fine brush in a cleansing solution. The drums will then be cleaned with a very light abrasive cleaner to remove any ingrained stains, and finally given a coat of wax polish for long term protection. All the parts have been cleaned and are ready to go back in to the score units, after the remainig components on those have been stripped and cleaned. 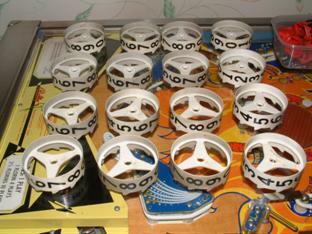 The nines and tens position switches, and the EOS switches, will be cleaned and the gaps and correct operation checked. The coils will be removed, the coil and sleeve cleaned (note that it it neccesary to loosen the switch stack screws to remove the coil from the bracket). The circuit board will be removed, cleaned and lightly lubricated. 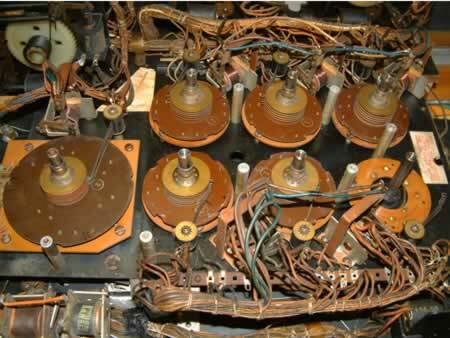 Four of the reels (the hundreds units) do not need circuit boards, so no wiper contact link is fitted to the cam. The remaining units need to tell the game what they are reading, the tens for the end of game match feature, the thousands and ten thousands for the high score. 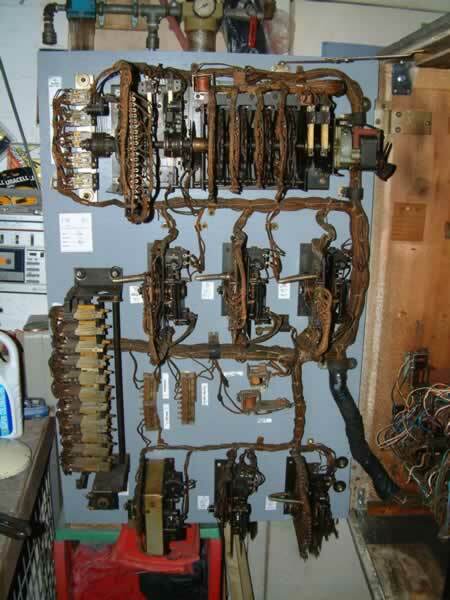 Also, the ten thousand units have no nines postion switches as they have no one hundred thousand units to step when they move from nine to zero and no EOS switches as the units are only stepped by the thousands units, so they have no locked score relay circuits to open. 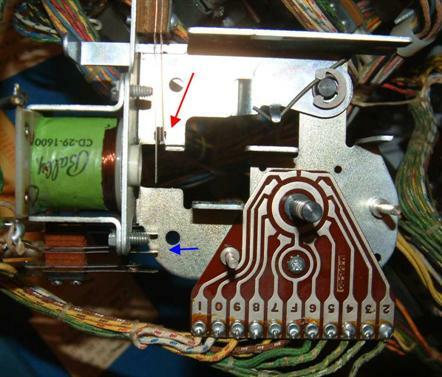 A pin on a lever runs in the cam slot, and it opens and closes the appropriate switches as the reel moves to read nine or zero. 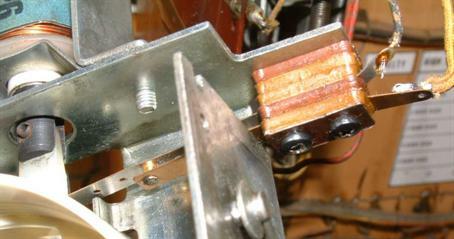 Whilst going through these score reels, one of the switch wires came adrift from a switch lug. Stripping a reel involves a lot of manouvering of the reels to access screws, and twisting the wires attached to them is unavoidable. This wire obviously did not have a strong joint and it broke. It was resoldered and is now fine. This game was functioning perfectly, so a quick clean of the score drums would have been the easy thing to do. 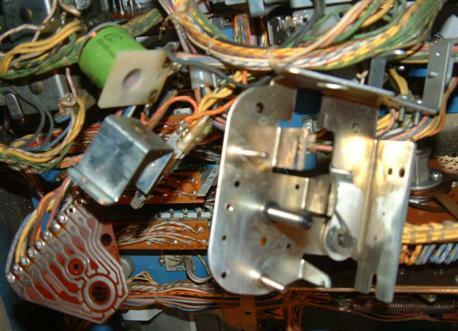 This shows that doing any job on an EM pinball properly can often uncover faults which could cause a problem in the near future. The wire was on a tens position switch blade. Had it broken off in a month or so, it would have stopped the game from resetting properly. 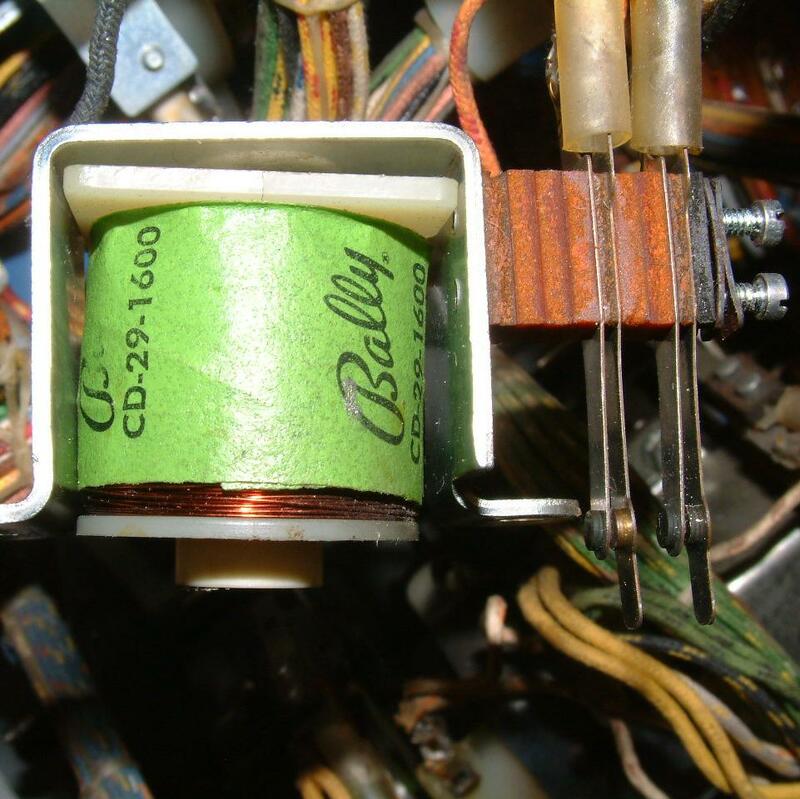 This game is in very good order, I did not even have to change a single coil sleeve. Everything is in excellent condition, with not even the slightest visible wear on any of the components. Considering this is a forty three year old game, it is evidence of how well the manufacturers engineered these vintage electro mechanical machines. Another common fault found in EM games are broken switch blades or missing contacts. The more often a swich operates, the greater the chance a blade will break off or a contact will wear out, come loose or fall out of the blade. EOS switches on coils that operate frequently are the most likely to suffer, either breaking across the contact hole or next to the stack. On a fully working game, it's usually obvious if the blade breaks, as the fault appears suddenly and the broken blade is there to be seen. If a game is purchased part or non working, the blade may be long gone and the fault is then much harder to find. Loose or missing contacts are also very difficult to locate, as the fault is usually intermittent. 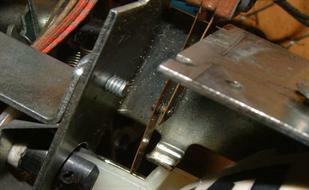 The blade can make some sort of circuit, even without its contact, but the circuit is often weak and unreliable. Bally bingo games often have broken blades, especially in the trip bank. As the stacks are large and hard to see, the fault can be very difficult to find. 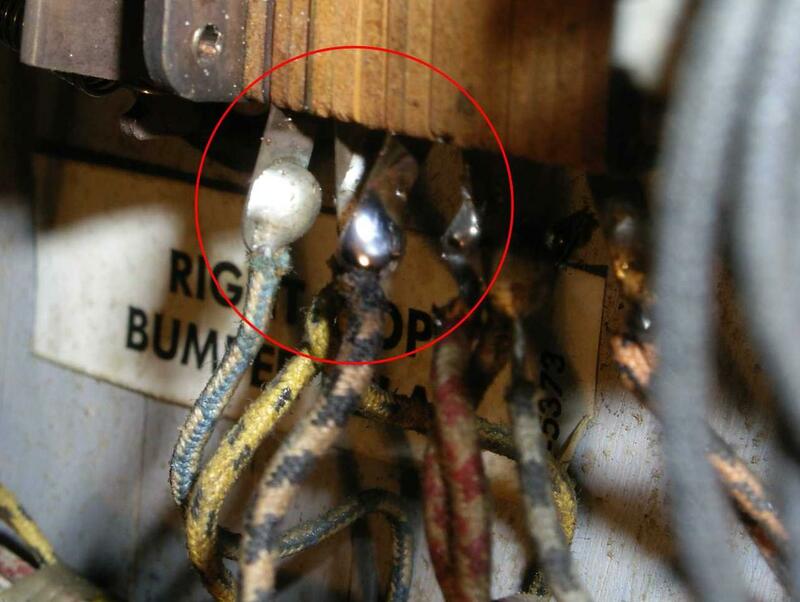 Another common problem is the solder lug breaks off the blade, but tugging the wires usually gives the location away. 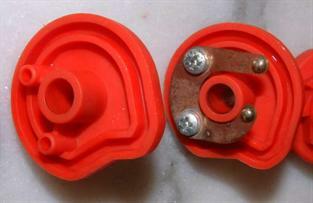 The solution is to replace either the loose or missing contact, or fit a new blade and contact. Below are images of a broken blade on an EOS switch. It was on the ones score unit of a Zaccaria game. It's no surprise as the ones unit is worked really hard, operating for every point scored. The blade has broken across the contact hole. The contact was loose as the blade cracked, notice the heat marks around the hole. 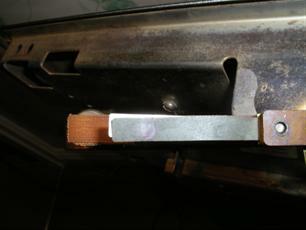 The high resistance created by the loose contact conducting poorly drew a high current, and made the joint hot. A new mediun strength blade and a new contact will be used. 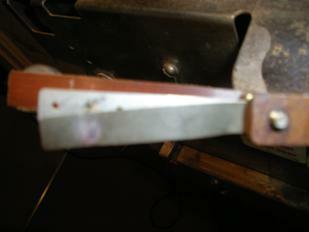 The contact is fitted and peened over. To be sure it doesn't come loose, I solder it as well. 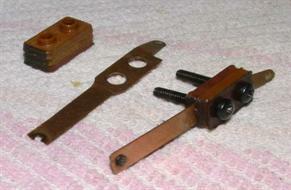 The stack is rebuilt with the new parts and the blade is cut to the correct length. It is then fitted to the bracket, gapped and adjusted. The wires are soldered to the lugs. It should be good for decades more use.